Operating and working on vehicles can be both fun and hazardous. Like others, I’ve made stupid and dangerous mistakes, but I’ve been lucky, and never been seriously injured. Sometimes we needlessly tempt fate because of bad habits or a lack of training. Using tire chocks when working under a car is a great idea, but before chocks are used we should practice the most basic method of securing our vehicles. The first step in parking. I have always practiced and taught that the parking brake should be regularly and properly used (with few exceptions, like ice). Unfortunately many otherwise knowledgeable and skilled drivers routinely do not use their parking brake, or use it incorrectly. Properly means that the parking brake should be firmly applied to hold the vehicle’s weight, on level ground or on an incline. Then the vehicle’s weight should be allowed to rest on the brake before the transmission is put in gear or Park. Firmly apply the parking brake, shift into neutral, release the service (foot) brakes, and confirm the parking brake is holding the vehicle. Then shift into Park if your A/T has a Park detent–many large RVs, buses, and trucks do not—or release the clutch on a manual transmission with the gear selector in first or reverse, the lowest gears. With routine and proper use of the parking brake, the parking brake mechanisms are exercised and continue to function. The operator will know how well the brake is working, how firmly it should be applied, and when it needs adjustment. There are other benefits to practicing this, like not routinely making the parking pawl on an automatic transmission hold the vehicle (wear), and shifting easily out of Park while on an incline. But surely the biggest benefit is assuring that your vehicle is safely and properly parked. If you only have the habit of using the transmission or the parking brake, and you forget to use that one method, a driverless-moving-vehicle can result. I’ve seen this many times, mostly recently a few weeks ago at my favorite coffee shop. A college kid parked his car and was walking into the store for his cup of morning medicine. Before he reached the door his car passed him, rolling into the back of another, which was parked in front of the glass wall where I was sitting. His car could have run him over, or come through the storefront, but bent bumpers were the only result of his negligence. 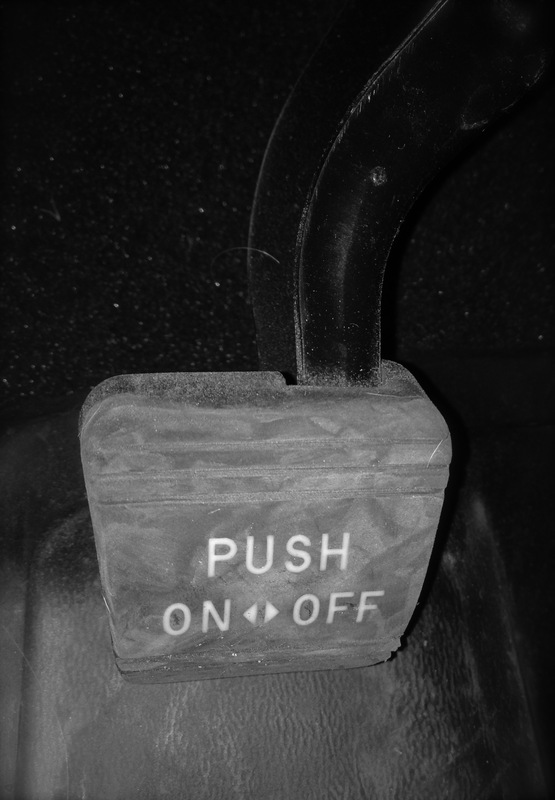 Does your parking brake footpad or handle lack signs of use?